There was a moment several years ago, when I’d struck up a conversation with another mom at the local playground. My towheaded two-year old had been playing nicely with her two young daughters, and we were sharing parenting nostalgia while we watched our children frolic in the early morning sunshine. All had gone well, until I made the grave mistake of being completely honest with this woman, who didn’t know me, granted. But we’d been conversing about temper tantrums and meltdowns, and I asked her, “Do you ever feel like you want to just go running outside into the street, screaming at the top of your lungs?” She quickly assured me that NO, that had never happened to her, she never felt the need to run away from her precious little angels, and made sure to hastily plop those two angels inside their double-wide stroller, leaving me and my honesty in the dust. Reading Whitney Dineen’s latest novel about her own experiences with parenthood, womanhood, and all things Costco, reminded me of that moment and several others I’ve had in my parenting journey. The moments where we don’t feel we’ve really earned that Mommy Gold Star. So often, I feel as though we’re told to put on this brace face, to never show the true colors of what’s going on in our lives, especially if it’s not considered “favorable”. The truth is, life isn’t perfect. There is no sugar coating how hard it can be to shape and mold the future. Dineen tells us about it in a way that brings emotional humor and depth to what’s really happening. In so many of her reflections, it’s apparent how much her daughters have shaped who she is today, even if at times she laments a little on the freedom she used to have before they were in the picture. Such an honest, candid response. Yet, she appreciates the impact they’ve had on her. It’s particularly touching how she goes into detail on the struggles she had to conceive, her own postpartum experiences. A voice for mothers everywhere who often feel alone, fearful of judgement. And Costco! 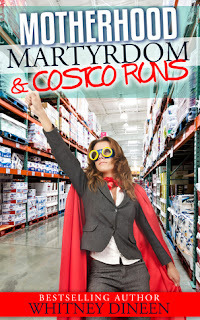 I laughed hard when I read the moments that happen in Costco, and could totally relate to the bathroom woes she deals with every single time she steps foot inside of a Costco. She has to map out her shopping route in order to incorporate a stop (or two, or three) to the bathroom, because her girls just can’t help themselves. Or the multitude of questions they always ask Dineen, the questions no parent wants to answer. Then there’s the conversations she’ll have with her husband, or her mother. Even the Costco check-out guy. It’s just all so funny! This is a must-read for any parent- those who have been in the trenches long enough to know when to duck and cover, to those who are just starting out. 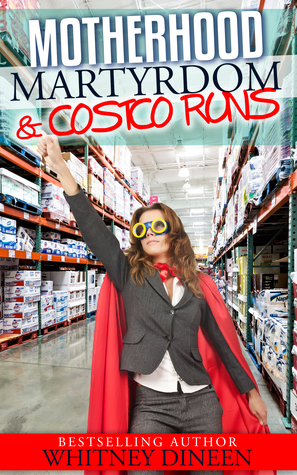 And while I never saw that mom at the playground ever again (most likely, she was trying to avoid me at all cost), if I were able to see her now, I’d totally give her Motherhood Martyrdom and Costco Runs as a loving gift, from one mom to another. Thanks to Whitney Dineen for the book in exchange for an honest review.